Green garlic shoots pesto and paneer salad. Green garlic shoots are seasonal greens and I like to use them more and more till they last. I make a few small batches of this green garlic pickle every season, the lehsunsagga as my grandmother used to call it. I like it so much that I make a few variations of it too. Sometimes I would add dill greens as in the original recipe and sometimes I would add coriander greens (cilantro) or mixed herbs. It is easier for me since I have sweet basil and thai basil growing in my home garden too. This mixed greens and green garlic shoots pesto is something everyone loves. I add green chilies for the Indian twist, may be you would like to add fewer green chilies or just omit it. It definitely is a forgiving recipe, adjusted to personal reference. The paneer salad with it just a breeze once you have the pesto with you. Just mix with the paneer cubes, smearing every cube of paneer liberally and let it stand for at least 15 minutes before serving. It tastes best when wrapped in fresh crunchy lettuce leaves. I took this salad to a picnic sometime ago so made a large quantity of it. Clean all the greens and chop them all roughly. Blend everything together except the extra virgin olive oil. 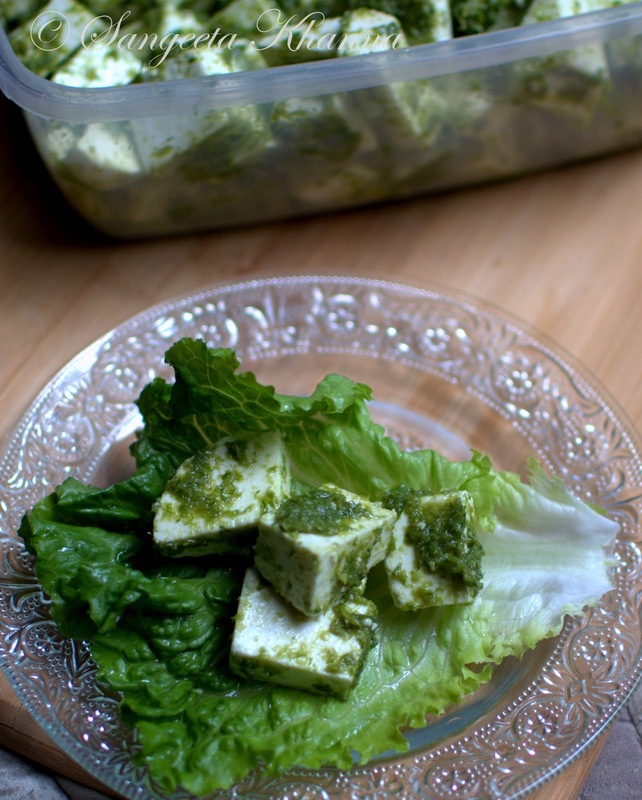 Empty into a salad mixing bowl, add the EV olive oil and then add the cubed paneer pieces. Mix well but take care not to smash the paneer pieces. This salad keep well in the fridge for a couple of days. The pesto keeps well for a week or so. If submerged in EVOO, it keeps well for about a month or more. If it lasts that long. I sometimes wrap this salad in large spinach leaves form my garden and it becomes a green garden salad for me. The leftover paneer pesto salad can be mashed and stuffed into parathas or swirl breads too. The best and freshest food that doesn't require cooking. If you are not making your paneer at home. 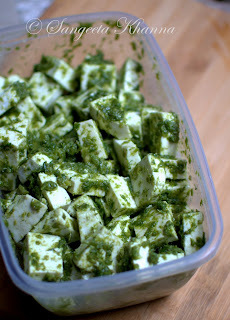 I highly recommend freshly made paneer for this pesto and paneer salad. I often use this leftover salad for making stuffed parathas. Just crumble this salad and use it to stuff whole wheat parathas for a wholesome meal. The paneer gets pickled in this marinade and tastes great as a paratha stuffing. 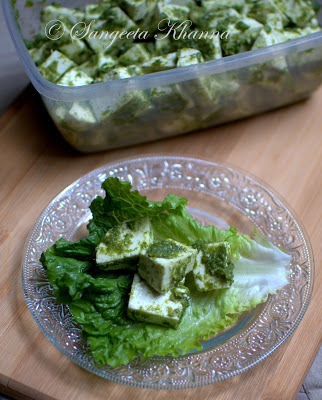 Green garlic shoots pesto and paneer salad..
Looks so fresh , i'm sure it would have tasted equally divine !! !